I formatted one partition on my external drive as MacOS Extended (Journaled, Encrypted). Now when I open Time Machine and want to use that partition I see a checkbox Encrypt backups. Because I don't want to encrypt my backups twice I unticked this checkbox. But when I continue Time Machine asks me for the password of this partition to be able to turn off the encryption. I do not want to turn it off. How can I use already encrypted disk? This unbelievable problem has simple solution. Just leave the checkbox ticked and the encrypted partition will be used as is. No double encryption. If you check the help ? there is written that the disk does not support encryption if the checkbox (Encrypt backups) is dimmed. 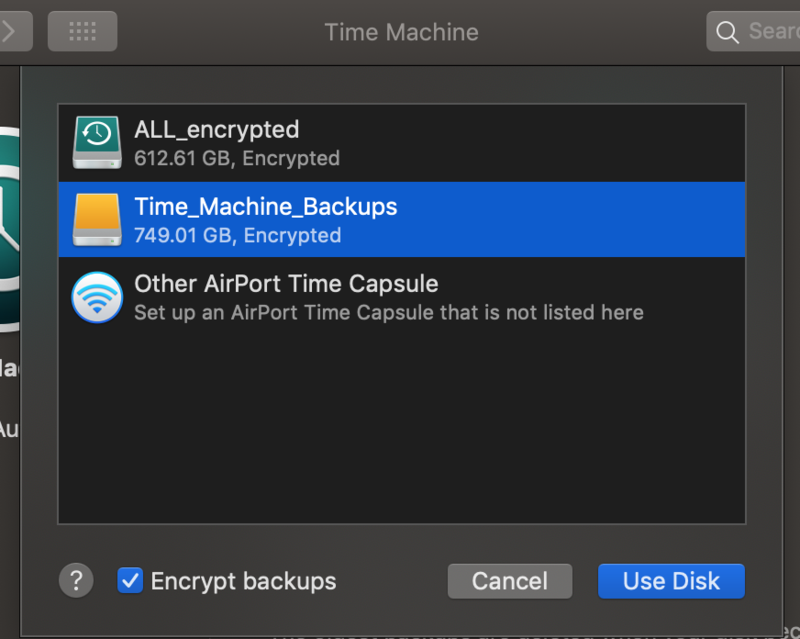 Hence implying Time Machine is using disk encryption not another one on top of that. So the checkbox is just for people who had not prepared the disk yet. Not the answer you're looking for? Browse other questions tagged backup time-machine encryption hfs+ .